George Washington believed that it was God’s providence and blessing that allowed our independence from Great Britain. When I went to school, we were taught that this country was founded to escape religious persecution. I guess they don’t teach that in school anymore. When the Constitution was written, there were many religions already established here, and they all had to be treated equally in the eyes of the law. Not one of them was “better than the others”. After more than 100 years, in 1892, The Supreme Court of our Great Land decided that America, in fact, was a Christian Nation. [See Church of the Holy Trinity v. United States] They examined thousands of documents concerning the founding of our nation. They said it took 10 years, but in the end, they issued a unanimous decision concluding that our very system of government and our laws are based on a Christian worldview. Among other matters, note the following: the form of oath universally prevailing, concluding with an appeal to the Almighty; the custom of opening sessions of all deliberative bodies and most conventions with prayer; the prefatory words of all wills, “In the name of God, amen;” the laws respecting the observance of the Sabbath, with the general cessation of all secular business, and the closing of courts, legislatures, and other similar public assemblies on that day; the churches and church organizations which abound in every city, town, and hamlet; the multitude of charitable organizations existing everywhere under Christian auspices; the gigantic missionary associations, with general support, and aiming to establish Christian missions in every quarter of the globe. These, and many other matters which might be noticed, add a volume of unofficial declarations to the mass of organic utterances that this is a Christian nation. Regardless of one’s religious, agnostic or atheist persuasion, there is no doubt that founders and the citizens of young America were guided by Biblical principles and Christian ideals. They embraced morals and ethics that seem to be absent today. 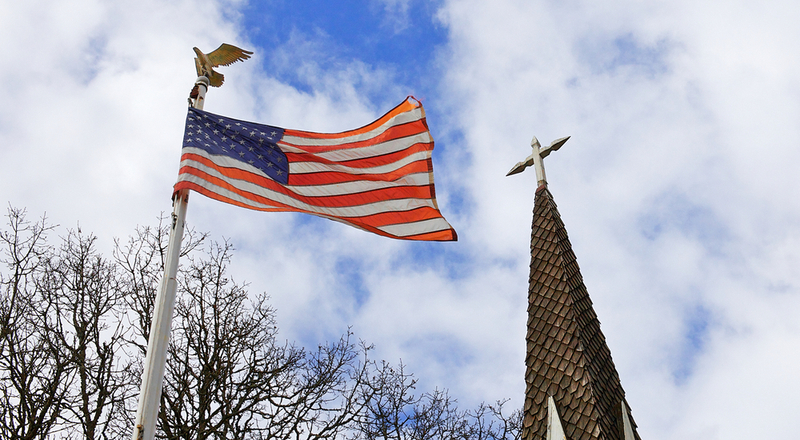 Yes, the United States of America is (was) indeed a Christian nation. Isn’t the Supreme Court the ultimate authority? Isn’t it the final arbiter? Are they ever wrong? So sayeth The Court! What has changed? In 1954, what has come to be known as the Johnson Gag Order was issued which prohibited Tax-exempt organizations (specifically churches) from endorsing or opposing political candidates. These organizations could lose their tax-exempt status if these provisions were violated. So God (the Church) was effectively removed from politics. The ethical & moral influence that had been part of our society for over 100 years was being stripped away. Then in the 1960s, the Supreme Court stripped God, Jesus, prayer and the Bible from our public schools, government and most of public life. It continues today. I think the idea is to remove belief in God – so that the people must believe in the government. This was certainly a misinterpretation of “Separation of Church and State”. If you do a little research on crime in America, you will see that shortly after those fatal Supreme Court decisions that violent and personal crimes began to increase and have continuously gotten worse ever since. Today’s America is not the America where I grew up. Our nation turned from God and He in turn pulled His blessings from us and now we have an America that is filled with spiritual and moral decay. In spite of what so many people tell me, it’s not too late for America. It is my responsibility to elect leaders who fear God and follow His statutes, and then God might restore His blessings upon us. For me, responsibility is defined as “My response to God’s ability”. I feel certain He does not support the Clinton Criminal Cartel. He knows they cheat, steal & rig everything. Not electing Hillary is the ONLY hope America has of recovering from the repressive nation we have become. Voting for Trump is a vote of NO CONFIDENCE in our Federal Government as it exists today. Voting for Trump WILL make America great again! Some say that God can work miracles. He could use your help. Take the responsibility that God has given you, too…. VOTE – and give God something to work with!